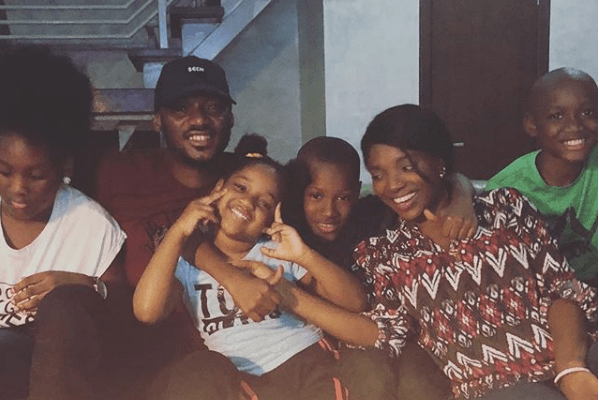 Actress, Annie Idibia has just shared this lovely family photo with her kids,step-kids and husband,2face. The photo was taken during her second daughter. Olivia’s birthday. God Shall Shut Every Mouth And Ceil Every Tongue Speaking Evil Into The Atmosphere Against You, Your Family,Career And finances .. Amen Happy New Month From Mine To Yours. God Bless Us All. Annie Macaulay–Idibia (born November 13, 1984) is a Nigerian, model, presenter and actress. She was nominated in the “Best Supporting Actress” category at the 2009 Best of Nollywood Awards. Annie was born in Ibadan but she is a descent of Eket in Akwa Ibom State. She moved into Lagos with her mother after the divorce of her parents. She holds a degree in Computer Science and Theatre Arts after completing undergraduate courses at Lagos State University and the University of Lagos respectively. And this na news huh?